After the Vanilla Chai failure of last week, I decided to try something a bit more “normal” for today’s tea experience. I hear people talk about Earl Grey tea a lot and it just so happens my sampler box has a Rooibos Earl Grey within so that’s the flavor of the day. I’m also writing about this as I experience it, so you get the real-time play by play tea escapade. I love the steeper thing. It was a complete impulse buy but it works great with loose leaf tea, I think. You put the leaves in, then add the water, and let it sit there. It looks like a science experiment. Very cool. Magic is happening right there in front of my eyes. There’s blue things in this tea. I have no idea what they are. I don’t know what, or who, an Earl Grey is. But it’s interesting looking, like weeds along the roadside. You know, full of vibrant color and maybe a few thorns? In water, it looks…well, not like something you should be drinking. Since I failed to produce anything resembling tea last time, today I boiled the water longer (in the microwave..I know I know but boiling water is boiling water, right?) 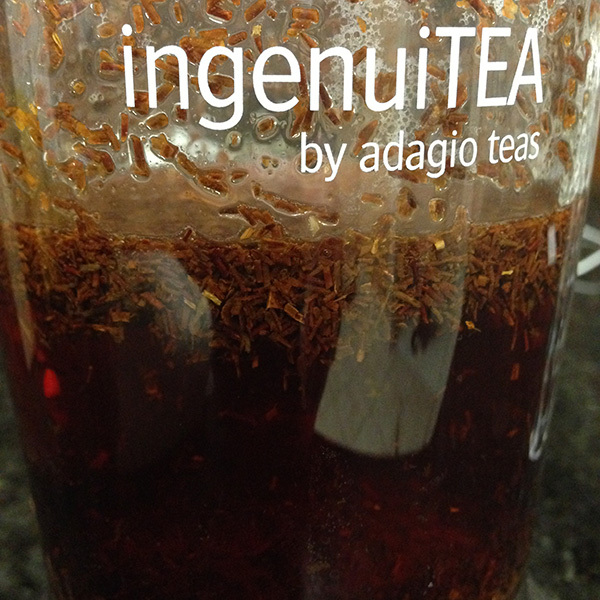 and I let Adagio Teas Rooibos Earl Grey steep four minutes longer than last time. This sat in the water I believe a total of nine minutes, give or take a few seconds. It made the kitchen smell like a flower shop. But the Rooibos Vanilla smelled great and look how that turned out. It’s all about the taste, right? So here goes. It definitely has a taste. Not strong, though. But not mere hot water either. I get a hint of something on the roof of my mouth that reminds me of the greenhouse from high school. I have no idea why. A bit flowery? Like I nibbled on the roadside blue flower. That’s it…it tastes blue! It’s not abhorrent or anything. It’s still not the strong taste I’m looking for though. Since I have nothing to compare this to other than Lipton iced tea and the vanilla chai, I looked up Earl Grey Tea online. Apparently, it’s supposed to have a distinctive citrus flavor and smell. I don’t get that at all. Nothing in my cup smells or tastes like anything citrus. I wonder if, once again, I somehow didn’t cook it right. Who knew tea would be so difficult to make! I think next time I’ll try hibiscus. I’ve been told it tastes like fruit punch and I’m dying to find out if that’s true.